As the cost of material escalates it becomes increasingly critical to minimize needless waste. 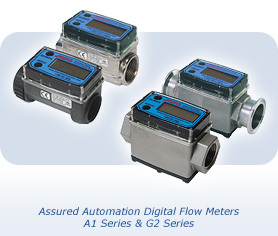 Assured Automation’s digial flow control meters help many diverse industries better manage their batch and dispensing processes. Meat Packers use the G2 Series Industrial Digital Flow Meters to monitor batch and continuous totals during batching of caustic and acidic cleaning agents when formulating cleaning solutions in portable barrels. The G2 Series Industrial Digital Flow Meters are also used in service stations and other fuel outlets to manage propane sales. The meters provide a simple, accurate and economical way to capture total dispensed propane to control inventory, both by volume and by weight. The meters are well suited for then demands of a rugged environment. The meter’s two displays allows operators to view resttable and cumulative usage. The A1 Series Commercial Grade Fluid Flow Meters are used in line on cement mixing trucks for any trucks used by the Department of Transportation (DOT) in many states. Placed betweeen the water storage tank and the mixing drum, the flow meter to verify specific batches fall within the tolerance of the original redi-mix recipes to meet the DOT “Slump” specifications. This entry was posted in Automotive Industry, Flow Meters, Food/Beverage, Latest News and tagged A1 Series digital water meter, Commercial Flow Meters, Digital Flow Meters, Flow Meters, G2 Series Industrial Grade Flow Meters, Industrial Flow Meters. Bookmark the permalink.